Directors: Kate Davis and David Heilbroner. 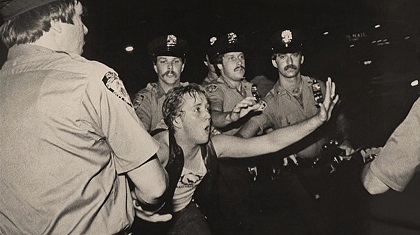 Documentary about the 1969 confrontation between LGBT bar patrons and NYPD officers, often credited with accelerating the gay-rights movement in the U.S.
Twitter Capsule: Valuable first-person testimonies invitemaybe requirea nimbler formal approach. Range of subjects too narrow. VOR: ③ Maybe a 2? Preserving these memories matters for communal and historical reasons, while functioning as well to distort and whitewash the record. Within its first minute or so, Kate Davis and David Heilbroner's Stonewall Uprising tells us via onscreen text that few photographs exist of the 1969 police raid on the Stonewall Inn, the now-legendary gay club in New York City's West Village, or of the spontaneous, watershed resistance that ensued among the club's criminalized clientele. Thus, we're told, "other images in this film are either recreations or drawn from events of the time." 2010, when the film premiered, much less 2019, as I'm reviewing it, feel like pretty late dates for debating the long-established but still-controversial role that dramatic restagings play in many films that nonetheless retain a legitimate claim as "documentaries"; I have no categorical quarrel on that score. What surprises me about Stonewall Uprising's use of these recreations is how unmarked they are in the rest of the text. The most attentive or craft-conscious viewers will certainly clock the moments when photographic qualities of the image or seemingly-impossible access to cloistered, chaotic events can only bespeak retrospective recreation. But unlike many nonfiction films that incorporate similar tactics, Stonewall Uprising largely effaces the distinction between what is authentic and what has been simulated. The film meticulously cultivates the appearance of a fairly conventional template, replete with talking-head closeups and stock-footage inserts, not just complementing but helping to produce the impression of historical truth. That sense of preserving an already-precarious record permeates many levels of Stonewall Uprising. Forty years after the events in question, the movie's driving impetus is to record eyewitness accounts from bar patrons, primarily, but also of police and of city officials before they are no longer available to offer them. I think it might have been more honest of Stonewall Uprising to expose its own seams a bit more, confessing how opaque this incident has already become (and, arguably, has always been), even as Davis and Heilbroner race to capture as much "direct" accounting as they can. Queer historian Scott Bravmann's 1997 book Queer Fictions of the Past is just one of many studies that confront the enmeshment of fact, embellishment, outright fiction, and irreoncilable perspectives that now accrue to "Stonewall" as a pop-historical flashpoint. Moreover, he argues, most historical events, especially those that loom largest in the mostly-occluded annals of subaltern communities, coalesce as unstable mosaics of actuality, projection, and invention. This doesn't mean that there is no "truth" left to report about Stonewall, but that even historical accuracy is a highly contingent, perspective-dependent notion, particularly regarding an event as tumultuous and unplanned as this one, where its importance only became evident with time. The most routine forms of documentary, summoning a rhetoric of this-is-how-it-was objectivity, can explicitly or implicitly deny these dimensions of history; the willful facsimile of such routines, assembled from troves of evidence whose elisions, redactions, and disagreements are unavoidably obvious to the storyteller, reflects an even greater, more dubious fantasy of telling The Truth, as though such a thing were possible. To be fair, Stonewall Uprising acknowledges this in plenty of other ways. Its privileged speakers, numbering around a dozen or so, do not all remember the raid, the insurrection, the wider ecology of late-60s Greenwich Village, or the still-broader experience of being gay in the mid-20th-century US the same way. Some, for example, recall the pre-riots Stonewall Inn as an important haven for its gay regulars; some as an unduly pricy, Mafia-owned thirst-trap that was best avoided; and some as an inconspicuous nonentity within their daily peregrinations on and around Christopher Street, and amidst their coming out or coming-into-consciousness as gay. The movie does not try to bring these divergent impressions into alignment, even as it conjures an overall, historically specific climate that likely informed everyone's experience. These included a much-vaunted "sexual revolution" whose public dimensions still took largely hetero forms, amidst a period when homosexuality's name was spoken increasingly often, including by broadcast-network exposés and classroom propaganda designed to snuff out an insurgent threat that the Silent Treatment could no longer contain. Stonewall Uprising incorporates several evocative excerpts of CBS's infamous The Homosexuals (1967) and other contemporaneous footage, alongside the candid, vivid recounting of many people who were the viewers and, whether or not they knew it or admitted it, the subjects of these so-called studies. Their memories and experiences are detailed but broadly accessible, moving without being maudlin. I'm glad that, via Stonewall Uprising, audiences will continue to hear them for several years. The movie itemizes in historically accurate, emotionally powerful ways the epidemic statistics of arrest, the informal protocols of seeking sexual pleasure, and the longstanding legal codes that prohibited cross-dressing, requiring everyone at all times to wear at least three articles of clothing "appropriate" to male or female gendernot counting socks! But, and it's a big "but," the folks whom Davis and Heilbroner have polled for their memories are almost entirely men, even more predominantly (perhaps exclusively?) cisgender, and monolithically white. This is a galling uniformity to encounter in any documentary about LGBT experience, or on any subject at all. But this is especially true in relation to the Stonewall Inn and its environs, host to a richly multiracial and diversely, complexly gendered milieuincluding on the night of the 1969 raids, when many people recall how intrepidly poor, non-white, gender-nonconforming folks led the spontaneous protest, including community stalwarts like Marsha P. Johnson and Sylvia Rivera. To be fair, these very real figures have accrued their own mythic lore. Debates persist about who exactly, in the frequent parlance, "threw the first brick." But no credible voices deny the racial, gendered, and cross-class mix of the initial protesters, or of those who remained most committed for several nights after, as the smashed and battered Stonewall remained a battlefield and a staging-ground for queer self-assertion. The makers of the risible, heavily fictionalized 2015 drama Stonewall learned the hard way that this truth has become self-evident far outside the circle of queer people's intramural memories, and that the centering of whiteness, a tiresome and violent mainstay in so much American storytelling, is especially unfounded and injurious in this case. Stonewall Uprising, released only five years before Emmerich's Stonewall, even more concertedly omits such diversity among its panoply of interlocutors. Issues around inclusive representation (read: accuracy in reporting) (read: portraying the world as it is) have of course become more prominent in the decade since the documentary appeared, but it certainly isn't the case that "nobody knew" in 2010 who really hung out at the Stonewall or played a front-line role on its most notorious night. Beyond just excluding people of color from the witness stand, Stonewall Uprising allows several of these white cis men to draw uncritical analogies to the activism of Rosa Parks and to the entire history of civil-rights work among nonwhite Americans. These speakers thus mobilize a nonspecific but all-too-frequent analogy to the experiece of people of color without engaging race as an important lens on these events. Still less does the movie acknowledge how many queer people were and are directly, non-analogically implicated in struggles for race-based freedoms and rights. Neither the talking-heads testimonies, elicited from offscreen interviewers (presumably Davis and Heilbroner) nor the montages of historical footage push back on this whitewashed history. Former Mayor Ed Koch, whose galling presence in Stonewall Uprising, as an ostensible voice of record is only semi-addressed, goes one step further to present gay people as more oppressed than all the nonwhite Americans that this documentary remarginalizes in so many ways, since "at least" black people have Constitutional protections that LGBT folks have never enjoyed. By the time one onscreen speaker describes the front room of the Stonewall Inn as regularly populated by so-called "A-gays, who didn't do any kind of drag [and] didn't use the word 'she,'" Stonewall Uprising has laid no context for framing his persnickety, elitist, and gender-panicked account of "respectable" gayness as this man's unique vantage (ironic or otherwise) or as a paradigm of white, cis, middle-class uniformity that the film, too, embraces as a desirable norm. The epilogue of the movie sustains this bias, deploying still photos of contemporary Gay Pride parades as evidence of what Stonewall made possible. As executed here, this visual archive also disproportionately favors white men, saying nothing about the corporate co-opting of these events or about the vicissitudes of enshrining "Pride" as an emblematic event, universal affect, or communal preoccupation for present-day LGBTs of all stripes.